I'll be saying goodbye to the kids in a few days while Mr S and I head to Greece for 10 days of archaeological wonders, lots of ouzo, long walks and off-the-beaten path adventures. It's a chance for us to nurture our relationship after 7+ years of parenthood, so while I'll miss the kids, I'm so looking forward to a chance to talk to my husband about something other than schedules, honey-do lists, and the kids. The kids will be in the able hands of their grandmothers, and they'll be having so much fun, they'll hardly miss us at all. But there's another goodbye this week, and this one is a sad one for the family. My daughter's best friend and her family are moving away. They're headed back home to Minnesota for a great job opportunity for her dad and to be closer to their family. Sofia has been her stalwart best friend for two years now, which in kid-years is close to forever. The news has affected my seven year old deeply, and her heart is close to broken when she thinks about it too much. Luckily, kids don't think about things too much, being so busy with the playing and the swimming and listening to the Broadway cast recording of Annie for the millionth time this week. But friends don't come easily for my girl, and she is anxious at the idea of a playground without Sofia next year. It's hard at seven to say goodbye to your best friend. She's not the only one who's sad. I've made a few good friends (hello, Montco Sit and Knit!) since I moved, but Sofia's mom was one of my absolute favorites. She's down to earth, hilarious, and someone with whom I felt instantly comfortable which is rare for me in my current social milieu. So I did what any bereft knitter with friends moving to cold climates would do. 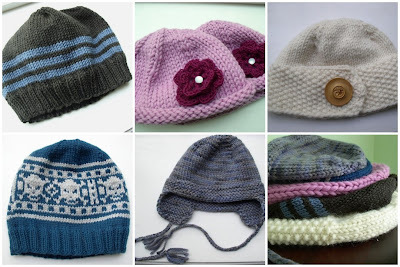 Embracing my inner Tiennie, I knit each of them a hat. They'll need the wool hats, and this way, they are sure to remember us. Check my Ravelry project page for details on each one. I've been trying to comfort my daughter by assuring her they'll always have these two years, and they'll always be each other's first best friend. We've talked about being pen pals and e-mailing and always sending a Christmas card. I reminded her about how we moved away, and we still have our friends back in Richmond, even though we don't see them often. And I told her how they now have matching hats, and on those frigid Minnesota mornings, when Sofia pulls on her hat, she'll think of her friend in Philadelphia wearing the same one. It's like the knit-version of the best-friend necklace, where each friend wears one half of the same charm. And while I didn't make matching hats for Heidi and me, I too am hoping that on those cold mornings, when she's getting her three kids ready to brave to cold, she'll pull on these warm wool hats and think of us, her friends in Philadelphia. I married into a great family. It was part of what vaulted Mr S's and my relationship from serious to consideration-of-marriage. As I considered the future of our relationship, I wondered whether I could look forward to holidays with his family, year after year. Could I really eat Thanksgiving Dinner with these people 20 years from now? The answer was an unqualified yes, and remains so. This weekend brought us to Maryland for a family graduation, and we stayed at the home of one of my most favorite in-laws, Mr S's aunt. She is a brilliant and accomplished scientist, a reader, world traveler, insect-o-phile and knitter/crocheter. Evidence of her handiwork were everywhere. 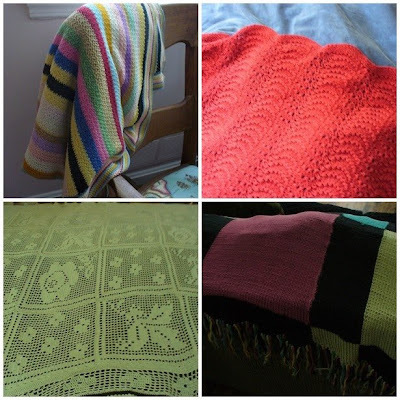 There were full-sized crocheted blankets and an enormous throw slung over the back of the couch. Even the little blanket she offered Rosebud to sleep with was a pretty feather and fan blanket. I aspire to having my handknits all around my home some day. I also had the chance to present my wonderful Mother-in-Law with a handknit birthday gift. I saw her a few weeks ago, and when she saw the beige wrap I was making, with trademark subtlety she mentioned how a beige wrap would just be perfect for air conditioned restaurants this Summer. Now, I must really love my mother-in-law, because a knitting long rectangle of beige stockinette is pretty boring. The Sunday Market Shawl is fast, yes, but it is dull. But I do love her and am happy to indulge her knitting requests, so I made a second one for her. This weekend, she happily modeled her shawl for me. She was all excited to take pictures of the two of us wearing our matching shawls, but mine needs to be reknit. Somehow, I managed to drop the wrong stitches, so my lovely ladders disappeared into the body of shawl, making a droopy, burlap-esque wrap. I've already frogged it, and plan on knitting a THIRD long rectangle of beige stockinette. Left, no ladders. Right, ladders. I would take a break from all the beige, but I really do need this wrap. It's a perfect summer layer. It will go with everything, from casual to dressy. It can be worn like a scarf and over the shoulders like a shawl. The silk is perfect for throwing over one's shoulders in drafty Athenian restaurants and protecting against sea breezes on the Aegean and nighttime walks along Cretan harbors. And since I leave for Greece in two weeks, I'd better get knitting! Notes: This was supposed to be a quickie one week project to bang out before school ended -- a present for Nora's teacher. It ended up taking a bit longer (about 10 days, but still in time!) due to some errors on my part. The initial lace pattern, the budding lace, is so quick and easy to memorize that I got a bit overzealous. I zipped right past the transition point for the lily-of-the-valley lace. Not a problem, I thought. I'll just have it be a bit longer, I was sure that I had enough yarn and that it would be just fine. Let's just stop here for a bit, shall we? Let's just reflect on how little I've learned about myself as a knitter. I won't belabor the point by linking the many, many posts where I've failed to correctly judge my yardage. Or fudged on the swatching. Or thought, no way am I tearing out, I'll just soldier on ... Sigh. So (surprise!) the lily-of-the-valley lace does not flow easily from the budding lace pattern. The numbers have to be just right and I was coming up with lots of different number situations. In total frustration, I headed over to The Yarn Lounge where Melanie and I had some quality time with a calculator. She was very patient as I regurgitated my numbers at her ("and if you subtract 1 and divide by 2 and then subtract 16 and divide by 10 ... it's all wrong!"). As it worked out (thanks Melanie! ), I have two extra repeats of the budding lace pattern and some important ssk's and k2tog's tucked in here and there in order to get the right numbers for the lily-of-the-valley lace. And (suprise again!) 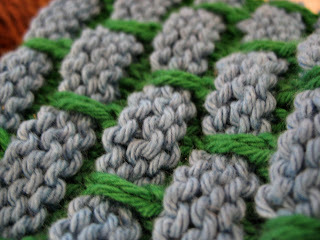 I didn't have enough yarn but I was smart enough to place a lifeline before beginning the edging. So back to TYL, where the crew very wisely advised me to pick an edging yarn that was a contrasting color and type (you know, so it didn't look like I had run out of yarn). 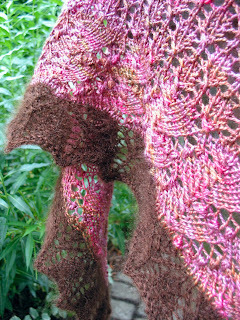 Enter the kid silk haze and the shawl was done! Hurray! 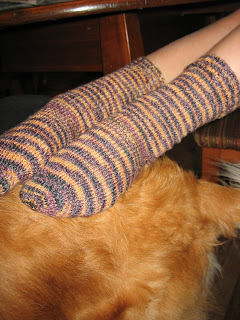 The yarns are beautiful together and I really, really loved this pattern -- with a strong exception for the nupps. The p5tog's just about broke my spirit. 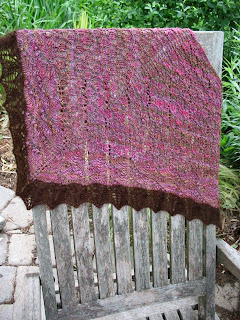 I was amazed at how the hot pink in the Sea Wool was softened by the heathery purples, pinks, and brownish-greens. Lovely. May Nora's teacher have a beautifully restorative summer! 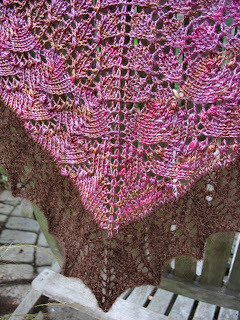 ... and I'm about to block a shawl which I will post about soon. Life has been a bit crazy and I've been laying low trying (somewhat successfully) to keep my home a peaceful sanctuary from the general decompensating that seems to happen during the Spring/Summer transition. But for now here are some socks as we count down the final days of school (6!) and the days until we leave for Norway (9!). These are for Nora and she loves the way they look with Luna's golden coat! 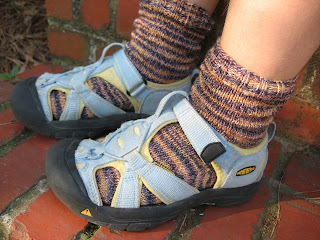 I knit these basic top down socks with a heel flap and a kitchner toe. I tried to do a short row heel, but found that it seemed to make the "bend" for Nora's foot too small and she couldn't get them on comfortably -- was this due to poor technique? or is there really more room with a heel flap? This yarn will be great for her sweaty feet since, as most of you know, it's 50% superwash wool, 25% soysilk, 22.5% cotton, and 2.5% chitin -- and naturally anti-bacterial. For knitting up, it was splitty. 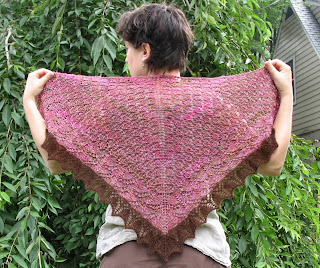 I hope to have a shawl to show you soon!